Hosted by the University of Surrey, in collaboration with the following Divisions and Interest Groups of the Academy of Management: Strategic Management (STR), Human Resources (HR), Management Consulting (MC), Organizational Behavior (OB), Organizational Communication & Information Systems (OCIS), Organization & Management Theory (OMT), Organizations & the Natural Environment (ONE), Social Issues in Management (SIM), Technology & Innovation Management (TIM). Be Inspired. Big data and digital technologies have impacted the modern workplace and stimulated the evolution of new forms of management. Connect with scholars advancing this rapidly evolving field and jump-start your own exploration of how big data and digital technologies are changing how we work and the world we live in. The Academy of Management Specialized Conference, “Big Data and Managing in a Digital Economy” is your invitation to join academics in business schools, related social science and other fields, and practitioners who value knowledge creation and application, to examine the expanding field of big data. The digital phenomenon is multifaceted and changes the way organizations compete and innovate. It threatens long-lasting business models, and opens up new ways of creating and capturing value. As such, it is not only clearly relevant for management practitioners, but also centrally important for management scholars. From research to best practices, this conference features a comprehensive program of presentations, active learning workshops, and panel discussions that provide the key learning and networking opportunities you need—to make the most of your scholarship and ideas. The Academy of Management Specialized Conferences Initiative was launched in response to members’ continued desire to participate in cross-disciplinary and geographically diverse events that allowed for deep dialogue and interactions through highly-focused gatherings. 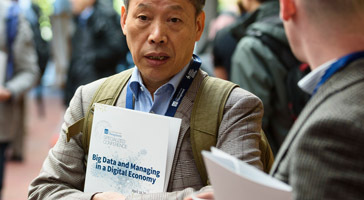 “Big Data and Managing in a Digital Economy” was the first conference organized under this exciting, member-driven initiative. 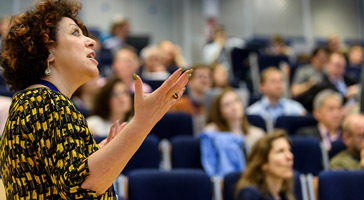 Hosted by the University of Surrey, this AOM Specialized Conference elucidated the importance of digital contexts and big data for creating and capturing value for businesses and society alike. In an increasingly digital economy, opportunities dazzle, threats loom large, and management challenges abound. Pervasively connected and powered by digital technologies, to which extent will modern organizations require or invent new forms of management? Big Data, digital businesses, platforms, innovation ecosystems, but also algorithmic organization, network effects, winner-take-all: far from being simply a purely technological phenomenon, digitization affects individuals, organizations, industries, markets, and regions. It alters individual and team behaviors, practices, organizational processes, industry dynamics, and impacts outcomes at several levels of analysis. The digital phenomenon is multifaceted and affects how we work and how we organize. It changes the way organizations compete and innovate. It threatens long-lasting business models, and opens up new ways of creating and capturing value. As such, it is not only clearly relevant for management practitioners, but also centrally important for management scholars. This Academy of Management Specialized Conference is hosted by the University of Surrey. To learn more about conference hosting and organizing opportunities, please review the Academy of Management's Call for Specialized Conference Proposals.